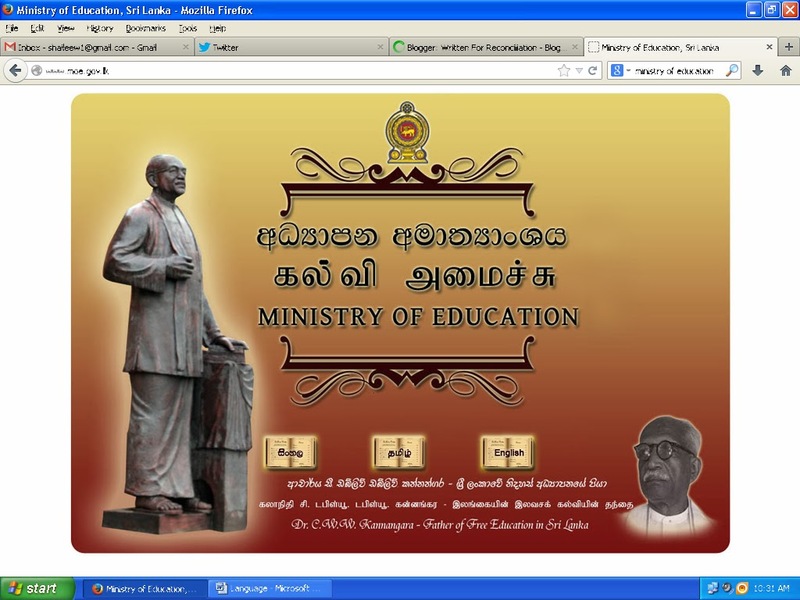 Sri Lankan websites, especially those of government organizations, are rarely up to date. We can’t rely on many of them for the latest news, although I must admit, they are extremely helpful. However, the most important and striking aspect of these websites is the language options they offer. To be honest, I have never chosen the Sinhala or Tamil option, although if I was to write a story in Sinhala or Tamil, I would definitely spend more time on those pages. If you look at the Wikipedia page of our nation, it says the official languages of the country are Sinhala and Tamil. English isn’t our mother tongue, and very few can speak English fluently. However, we all learn the language in school. We sadly seem to have forgotten though, that English is a foreign language to us and ridicule or look down on people who aren’t fluent in the language or those who don’t have a grasp of it. One day, I was at a food court, with my mother, and it was crowded but we wanted ice cream so we had to share a table with two men. Now these two were in the middle of a business deal, which they were discussing in Sinhala. They had also not yet bought any food. So a very young security officer walked up to our table and told these two men that they had to order something, since it was a FOOD court and there were so many people looking for a place to sit. The security officer spoke to them in Sinhala. Suddenly, one of the men started scolding the security officer in English… Wait, in broken English. The security officer clearly didn’t know a lot of English and repeated his ‘request’ in Sinhala. The man shouted him further and as if to insult him, bought a single samosa, which no one ate. Recently, I went to the American Center for a work related assignment. The security ‘hut’ you have to go through to get into the American Center is there to test one’s mental status. It is that confusing. Anyway, I’m not quite good with places and finding my way, so I asked one of the guards, in Sinhala, where the reading was taking place. And he replied in English and kept talking to me in English. Which I had no issue with since the man clearly knew the language. However, why did he insist on talking to me in English? Surely, he knew Sinhala or could manage to talk a few words in Sinhala. So why do we assume that talking in English makes us seem more educated or as if we come from a ‘good’ family. This is the sad truth and we can’t deny not contributing to such beliefs. A recent tweet about this issue received a good reply from a friend. And it hit me that yes; I too prefer talking in English. Whenever I have to call someone for work related things, I hope and pray he or she speaks English. This is also because if they talk in Sinhala I have to translate what they say. But mainly because I’m more confident with my English than my Sinhala. Which is a shame because for eleven years of my thirteen years in school, I studied in Sinhala. Further, I keep complaining about how Sri Lankans didn’t like their Sri Lankanness. So there was no excuse for me to prefer talking in English, for me to avoid Sinhala. Then I thought about it. There was a difference between comfort and shame. Sure I was more comfortable talking in English. However, this didn’t mean I was ashamed of my Sinhala. While I would rather talk in English, if I needed to, I could always talk in Sinhala. And slowly, I was beginning to talk more in Sinhala. As a Sri Lankan, I think, one must know at least two languages. It comes naturally for most of us. And we mustn’t use our knowledge against people. I’ll end with two authors I interviewed recently. They are both Sri Lankan authors, both Sinhalese. One was a male, the other, a female. The male writes in both Sinhala and English, while I doubt the female writes in Sinhala. Both interviews were at the homes of the authors, and I was accompanied by the same cameraman. And usually these aren’t question and answer sessions, but conversations. She asked us about our own opinions, which was nice. But she asked them in English. Now the cameraman doesn’t speak English, so he kept quiet. Since I talk to him in Sinhala, the person being interviews usually gets the hint and switches to Sinhala. Not Wijenaike, who kept talking in English, making us all uncomfortable. He would talk to me in English, and during the conversation ask the cameraman questions in Sinhala. About books, whether he reads and so on. So it was a very nice conversation where all three of us had a nice chat. I think the way the two authors handled the situations says a lot about the people they are. While I enjoyed both interviews, and I enjoyed writing both stories, one author I respect more than the other.